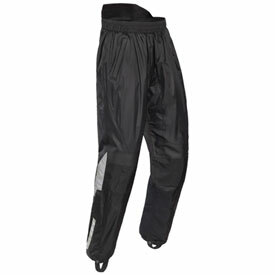 Waterproof/breathable stretch material panels above knees provide flexibility and comfort. High-Density nylon seat panel provides added strength and minimizes slipping. Ergonomic, four-panel knee design provides increased comfort in the riding position. Two zippered hand pockets for convenient storage. 3M Scotchlite® reflective piping increase visibility at night. Includes a jacket to pant zipper attachment that matches perfectly with the Tour Master Sentinel 2.0 Rain Jacket. Elastic waistband and high-rise rear panel seal out the elements. Extra long zippered and gusseted leg cuffs with Velcro® flap closure allows for ease of dressing.